At the invitation of the governments of the State of Kuwait and the United Arab Emirates, member of the Political Bureau and Director of the Office of the Foreign Affairs Commission of the CPC Central Committee Yang Jiechi will pay official visits to Kuwait and the United Arab Emirates (UAE) as the Special Envoy of President Xi Jinping from April 28 to 30. Comrade Yang Jiechi's upcoming official visits to Kuwait and the UAE as the Special Envoy of President Xi Jinping are important ones paid by the Chinese leadership to the Gulf region of the Middle East under the new circumstances. Kuwait was the first Gulf Arab state to establish diplomatic ties with China, and the UAE was the first Gulf Arab state to forge strategic partnership with China. Recent years have witnessed rapid development of China-Kuwait and China-UAE relations. China, Kuwait and the UAE share similar development philosophies and compatible foreign policies and our three countries understand and support each other on the issues concerning each other's core interests and major concerns. Kuwait was among the first countries to ink cooperation documents on the Belt and Road Initiative with China. Our two countries have complementary development strategies, and we have achieved notable cooperation outcomes in the areas of energy, trade, investment, financing, infrastructure-building and cultural and people-to-people exchanges. At the end of 2015, when his Royal Highness the Crown Prince of Abu Dhabi Mohamed bin Zayed Al Nahyan visited China, President Xi Jinping and other Chinese leaders reached a series of important consensus with him, which charted the course for the development of China-UAE relations. Our two countries have achieved tangible cooperation outcomes in such areas as energy, trade and economy under the framework of the Belt and Road Initiative. During this visit, Special Envoy Yang Jiechi will meet respectively with Kuwait's Emir Sabah Al-Ahmed Al-Jaber Al-Sabah, First Deputy Prime Minister and Minister of Defense Nasser Sabah Al-Ahmad Al-Sabah, Deputy Prime Minister and Minister of Foreign Affairs Sabah Al-Khalid Al-Hamad Al-Sabah, the UAE Crown Prince of Abu Dhabi Mohamed bin Zayed Al Nahyan and Foreign Minister Abdullah bin Zayed Al Nahyan, and they will have an in-depth exchange of views on bilateral relations and international and regional issues of common interest. 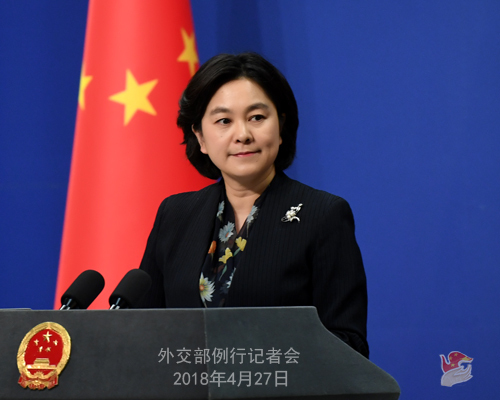 China hopes that these important visits can help to further cement China-Kuwait and China-UAE traditional friendship, enhance political mutual trust, elevate cooperation in various areas to a new level and move forward the China-Kuwait friendly and cooperative relations and China-UAE strategic partnership. Q: Today ROK President Moon Jae-in and DPRK leader Kim Jong-un held a historic summit. What is your comment? A: We all saw the live-broadcast of this historic moment this morning when the DPRK and ROK leaders stepped across the military demarcation line at Panmunjom and shook hands. We applaud the historic step taken by the two leaders, commend their political resolve and courage in doing this, and sincerely hope that their meeting will achieve positive outcomes. As a Chinese poem goes, "brotherhood will survive all vicissitudes, and a smile is all we need to dissolve old grudges". We hope that the historic summit at Panmunjom will be taken as an opportunity for all to embark on a new journey towards lasting peace and security on the Korean Peninsula. Q: The US Air Force said that B-52 bomber aircraft conducted missions in what they say was the vicinity of the South China Sea. Taiwan media report that they actually did fly over the South China Sea. The Defense Ministry made a response yesterday. Do you have more details about this? A: I would refer you to the Defense Ministry. Q: The spokesperson of the Russian Foreign Ministry said on April 26 that the Russian side is seriously concerned about the statements made by the US and French leaders on the Joint Comprehensive Plan of Action (JCPOA). Russia sees no room for amendments or additions to the deal which is a balanced mechanism that takes into account the interests of all its participants. The destruction of this fragile balance of interests will lead to serious consequences for international security and the non-proliferation regime. She said Russia will continue to fulfill its obligations under the JCPOA as long as other participants remain committed to it. What is your comment? A: The JCPOA is a multilateral agreement reached by the P5+1, the EU and Iran through negotiations and endorsed by the UN Security Council Resolution 2231. 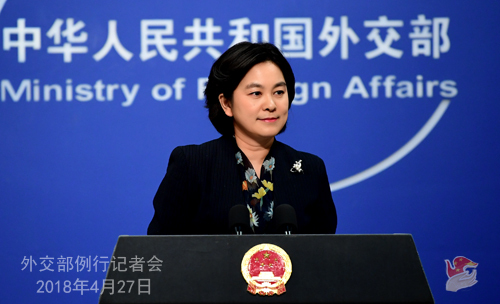 China believes that all relevant parties shall step up dialogue and coordination in response to the current circumstance facing the JCPOA so as to safeguard its sanctity and integrity. China would continue to maintain and implement the JCPOA with an objective, unbiased and responsible attitude. Q: According to media reports, US President Donald Trump's key economic advisers will accompany Treasury Secretary Steven Mnuchin during his upcoming visit to China. Director of the National Economic Council Lawrence Kudlow, US Trade Representative Robert Lighthizer and Director of the National Trade Council Peter Navarro are among them. Can you confirm this information and give us any details? 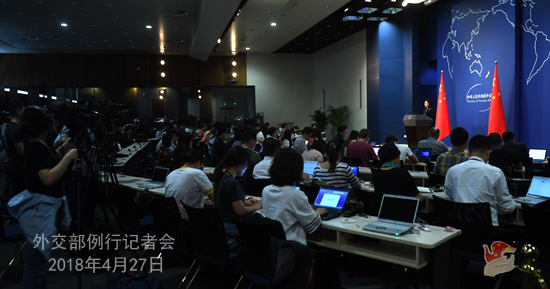 A: Regarding the US sending senior economic and trade officials to China for consultations on bilateral economic and trade issues, the spokesperson from the Ministry of Commerce has made clear China's position. We have received the information that the US hopes to come to Beijing for consultations on trade issues, and we welcome that. We are willing to hold equal-footed consultations with the US side on the basis of mutual respect. As for the detailed information, I would refer you to the Ministry of Commerce. Q: The US Senate adopted a resolution on April 26, claiming that the responsibility for identifying a future 15th Dalai Lama rests solely with the officials of the 14th Dalai Lama's private office; any interference from the Chinese government in this religious activity is invalid. This is the first time that such a resolution was adopted by the US Senate. We know that the US State Department released its 2017 Country Reports on Human Rights Practices days ago, laying accusations on China's human rights conditions including the issue of ethnic minorities. What is your comment? A: The adoption of this resolution by the US Senate is another proof of some American's habitual and inexplicable ignorance and arrogance. The reincarnation system for the Living Buddhas is unique to the Tibetan Buddhism, which has been in existence for several centuries with a complete set of religious rituals and historical conventions. The reincarnation of the Dalai Lama shall follow these religious rituals, historical conventions and Chinese laws and regulations. It is not to be dictated by anyone, let alone a foreign country that has nothing to do with this. Some US lawmakers and officials should have devoted themselves to serving their constituents. Regrettably, they seemed to deliberately choose to ignore their domestic issues while over-enthusiastically tending to other country's domestic affairs with all these finger-pointing and irresponsible remarks. You may have noted that the US has got a lot on its plate to deal with. According to the Human Rights Record of the United States in 2017 just released by the Information Office of the State Council, systematic racial discrimination in the US aggravates social split and exists in law enforcement and judicial organs. A report by the National Registry of Exonerations has confirmed that in murder cases, innocent blacks are about seven times more likely to be wrongfully convicted than their white counterparts, and 12 times more likely to be wrongfully convicted of drug crimes. For the same crime, the African male criminals get a 19.1% longer time behind bars than the white male criminals. Besides, ethnic minority people in the US are at a full disadvantage in employment and salary. Over a quarter of African families have zero or negative net assets. 42 percent of the surveyed Americans say they personally worry a great deal about race relations in the US and 58 percent say racism is a big problem in their society. We believe that the relevant people in the US shall first and foremost know their position well and get their house tidy and in order before uttering irresponsible accusations against other countries. The Regular Press Conference of the Foreign Ministry will be adjourned on April 30 (Monday) and May 1 (Tuesday) for the May Day holiday and resumed on May 2 (Wednesday). During the adjournment, journalists can raise questions to the Spokesperson's Office by fax or email. I wish you all a happy holiday!